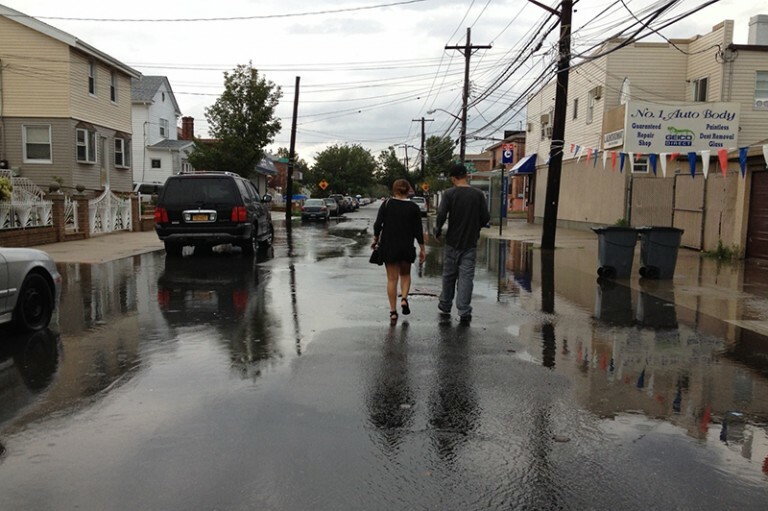 The low-lying south Queens communities of Old Howard Beach, Hamilton Beach, and Broad Channel are vulnerable to tidal flooding today, and the conditions are only expected to worsen with projected sea level rise, according to the Department of City Planning, which presented current planning initiatives and priorities for Queens on Monday at a joint meeting of the Borough Board and Cabinet at Borough Hall. Hamilton Beach and Broad Channel are far more challenging, DCP noted. A lack of infrastructure solutions presents obstacles to mitigating the impacts of sea level rise. The unique built environment of Hamilton Beach and Broad Channel – narrow lots, and narrow, low-lying streets – pose challenges for resilient retrofitting and reconstruction. Existing R2, R3-1, and R3-2 Zoning Districts do not account for narrow lot frontage in the residential areas of these communities, DCP noted. Additionally, new, higher flood elevations present physical and economic challenges to the two commercial corridors: Cross Bay Boulevard and Coleman Square. However, City Planning pointed out that there are opportunities to identify changes to zoning, both in residential areas and business corridors; to maintain neighborhood character, facilitate customer access to businesses, and enable resilient retrofits and building. The analysis of these communities is part of DCP’s Resilient Neighborhoods planning initiative, which works to identify neighborhood-specific strategies to support the vitality and resiliency of communities in the floodplain and prepare them for future storms. According to the agency, each study considers the unique character of each community and the specific issues and opportunities, but is guided by a set of common goals: Reduce risks from natural hazards such as flooding and coastal storms; foster economically and socially vibrant communities that are able to adapt to changing conditions; and coordinate land use planning with rebuilding activities and infrastructure investment. Build off outreach from other efforts, including the NYC Special Initiative for Rebuilding and Resiliency, and NY Rising programs. Provide clear, concrete information to residents on potential strategies for increasing resiliency that are implementable. Shape recommendations based on robust public outreach. Result in the implementation of regulatory changes through ULURP and make recommendations for infrastructure improvements.